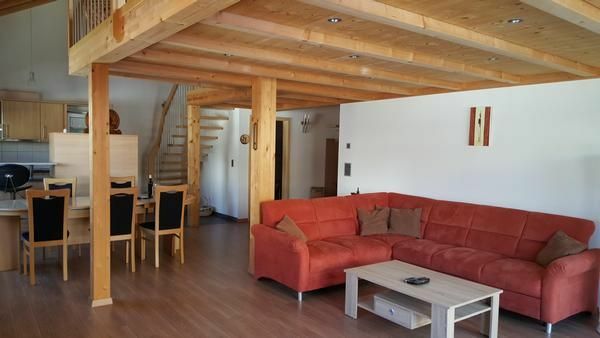 Modern spacious 3rd 5 room apartment (100 m2) in. 1 Floor of a family house, with underfloor heating. On the ground floor is a garage parking space available plus storage space for bicycles and skis (Wachsmöglichkeit). Living and dining room flooded with light with TV radio and internet connection. Kitchen with Nespresso machine, kettle, egg machine div. Baking utensils, dishes is for 5 people double. The bathroom is equipped with a double sink, shower, towel dryer, washing machine and tumble dryer. It has 2 bedrooms with a double bed, the second with a French bed and a single bed, cupboards and chests of drawers. Gallery with reading corner div. Party games and a beautiful view of the Galenstock. The kitchen towels as well as the bed linen and bath towels is on site and included. Final cleaning: once per object costs in the amount of 150 CHF (obligatory). Tourist tax: per person and day costs of 3 CHF (obligatory).